There are fun things happening in Carlisle PA this weekend! At the Carlisle Theatre on Friday evening, you can experience a "classic rock event with two of the all time greats" - Pure Prairie League and Firefall. Tickets are still available online. Come enjoy some great classic rock music! Here comes Peter Cottontail at Meadowbrooke Gourds! You can create your own bunny anytime during regular store hours on Friday or Saturday. There will also be a "Birdhouse Oops! Tent Sale" where you can purchase gourd birdhouse - 2 for just $20! Meadowbrooke Gourds is located in a wonderful country setting and a beautiful drive from Pheasant Field B&B. If you love farm critters, you can visit the Jubilee Alpaca Show at the PA Farm Show Complex. Lots of fine fiber, wool fashions, and fun will be found at the Mid-Atlantic Alpaca Association's yearly event. Special value weekend at Pheasant Field B&B! Stay in Suite Remembrance, Gen. Miller's Retreat, or Lady Amherst's Library and enjoy an extra value package valued at $65. Warm up your spring with a romantic game to take home with you, some spring flowers in a special Pheasant Field bud vase, and 2 wine glasses to take to Hunters Valley Winery for wine tasting (where you will receive a bottle of wine to bring back to the B&B). All these special gifts are yours FREE for this "Spring Warm Up" special. You must mention that you saw this special! It's time for your Spring Getaway! 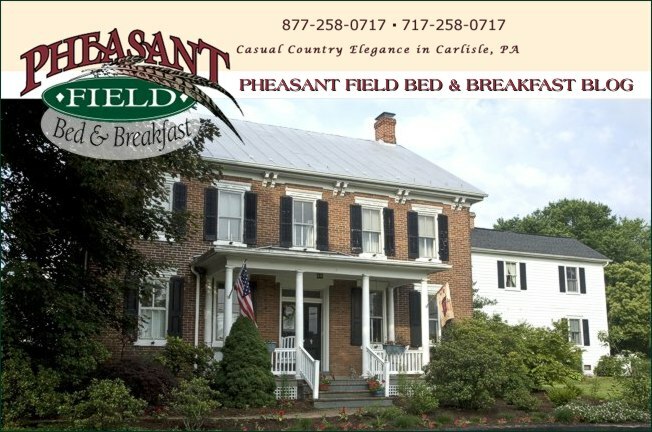 Reserve your room now at Pheasant Field Bed & Breakfast in Carlisle PA!